Reality of drunk driver versus normal driving. 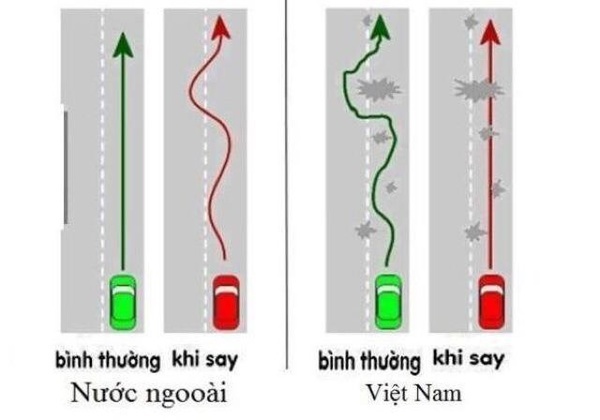 Well this picture separate US versus Vietnam road to be exact. Vietnam road if you’ve been in Vietnam before, you would know that the road has many pot holes and drivers would always tried to avoid pot holes. Left side of the picture depict USA road way. In green would be typical drivers not drunk yet. Red would a be a drunk driver. Right side of the picture. Green driver tried to avoid pot holes in Vietnam. Red is a drunk driver just keeps on going straight LOL.